Saving this guidebook offline in your phone, will help you out massively when on the ground (there in no reasonable internet connection on Andamans). Download the book directly from us, the Authors, for $3,99 only (via Payhip). You will need Adobe Acrobat Reader or any reader capable of reading PDF documents. The biggest retailer offers the book at various prices at all other Amazon shops worldwide. You can read the book on any device with Apple Books. Check the beautiful design optimised for landscape reading on iPhones 6, 6+, 7, 7+ and higher. You can use Google Play Books on all Android, Apple iPhone iOS and Windows devices easily. When planning our 10 week adventure, we found surprisingly little information about Andaman Islands. To be honest, we found either none or outdated information and nothing practical for real traveler. 🤨 Arriving to the archipelago, we were thrown into those pleasant time of nineteen nineties, when internet and mobile phones did not exist and travel information was gained by talking to locals on the ground, occasional fellow traveler, exploring yourself 👍 or using printed guide book. 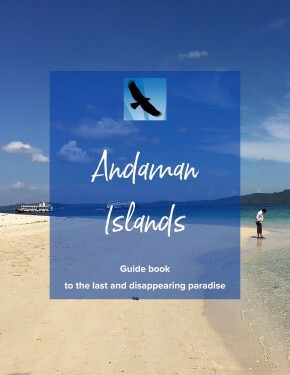 However, even as of 2018, none such guidebook existed for Andaman Islands 😮. How to plan a trip to Andaman Islands and what highlights not to miss? Beaches, turtles, waterfalls, marine life. You are asking yourself: how can I manage to see everything and how much time do I need? The answers are included. Getting there and around Andaman Islands. Ships, buses, jeep, tuk-tuks (auto rickshaws) and helicopters are available on the archipelago. Ships will ferry you between the islands, buses will transport you along the Andaman Trunk Road from South, via Middle and all the way to North Andaman. The most attractive option is flying a helicopter. Huts, hotels and resorts at Andaman Islands. Your sleeping options range from bamboo huts with a mattress on the floor to luxury rooms and cottages. Prices start from 6-7 € per night for bamboo hut to over 100 € per night for luxury rooms. Read more and avoid overpriced tourist traps on Havelock and Neil islands. Useful guide to Port Blair. I keep general info to the minimum and focus on info real individual traveler’s needs. Why visit / Highlights. Many people just pass thru on the way to Havelock. However, Port Blair does have one spectacular sight, worth budgeting an extra day. And it is not the jail. What is it? Neil Island, together with its bigger neighbor Havelock are two most visited Andaman islands and thus two most touristy ones. Visitors mostly tend to think of Neil island as being more quiet alternative to Havelock. Having visited 13 Andaman islands, we have difficulties to agree with that. The real beauty and the best area of the whole Andaman and Nicobar archipelago, is in the north. Still, not many people make their way this far. Good for you! When you take this little extra effort, you can enjoy the area with little to no tourist in sight. has that sensational feel of the end of the world. Kilometers of Beaches are completely free of any humans, jungle waterfalls and water reservoirs wait just for you. Enjoy a motorbike ride and feel the complete freedom to discover the beauty of this island. And it is surprisingly inexpensive! You may consider visiting Long Island for its beautiful Lalaji Bay beach and nice jungle walk heading from the inhabited south of the island to the Lalaji bay. If you prefer to read the information included in the guidebook online, you are welcome. Choose the section below and enjoy. We do recommend keeping the guide book on you device offline. There is no reasonable internet connection available once you reach Andaman and Nicobar islands and guidebook available to you off-line, may save your day 🙂 Your support is appreciated, either via the guidebook purchase or via clicking some of the add on this page. Thank you very much. Andaman guide online home page - read more topics, details of cities, islands ; click here.